"For me the process of drawing and painting is a meditative experience. I paint in order to discover, explore, and express the relationship between my inner being and all that surrounds me - the environment, the world, the universe. "I love to walk the hills and valleys, moorland and dales around my home. Up on the moor I can expand into the space between earth and heaven, watch the clouds erase and reveal further horizons, feel the strength of the earth beneath my feet, walk over the peaty layers of time. Finding a tiny rare flower in a vast seemingly empty landscape can be an unexpected joy in this land of infinity. Referring to these experiences I use layers of fluid oil paint, which I apply and remove until the final image emerges. "It is from this work that the book Climb up to the Moor developed." "For many years I kept a written and visual journal of my life’s journey. The paintings are small watercolours, some tending towards the representational, but most of them having a more symbolic use of line, form and colour. I sometimes enjoy developing these little watercolour images using oils on large canvases - coming round again to an exploratory approach, to expressing what ‘makes my heart sing’, layers and levels of experience - paintings from the soul." Judith has lived and worked in Askrigg since 1973. Her work varies from large landscapes to small flower studies, and from traditional to a more exploratory approach. Inspired by the contrasts of wild empty moorland and flower filled meadows, high rushing waterfalls and slow reflective rivers, walls encrusted with mosses and lichens, and quiet secretive woods, she uses a variety of media - oils, pastels, gouache and watercolour, to express her deep love of the Dales countryside and all its seasonal moods. Her studies of wild flowers are particularly well known. 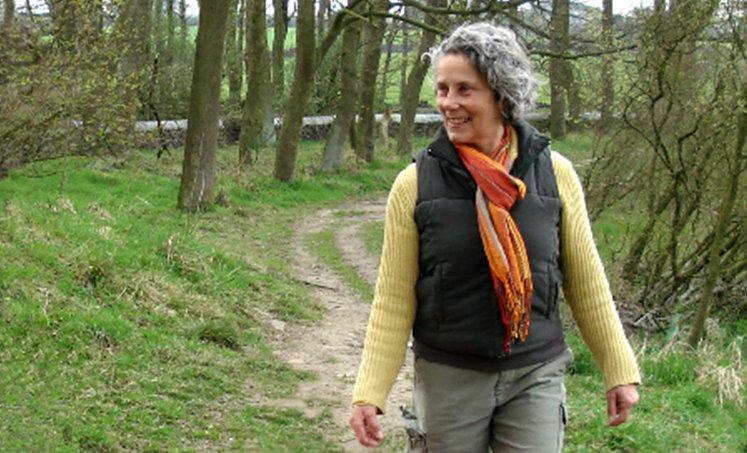 Her first book, Step into the Meadow, published to celebrate the 50th birthday of the Yorkshire Wildlife Trust, was based on a collection of paintings of a traditional Dales haymeadow throughout the seasons. This was followed in November 2003 by Come Down to the Wood, based on a year in the life of a local woodland, and which has additional paintings by Robert Nicholls. Climb up to the Moor is their third book. Judith’s work has been shown regularly in many one-man and joint exhibitions nationally, including the prestigious Painters of the Dales exhibition; and also features in the book produced by the Yorkshire Dales Millennium Trust – The Yorkshire Dales, a view from the Millennium; and in The Yorkshire Dales, a 50th anniversary celebration of the National Park. She was a founder member of the Askrigg Group Exhibition, which was held for 25 years during August, first in Askrigg and later in the Dales Countryside Museum in Hawes. Judith was for many years a visiting tutor at Woodbrooke Quaker Study Centre in Birmingham. She developed workshops and courses which explore the spiritual aspects of creativity - Contemplation & Creation, and during 2001-2 was awarded a Joseph Rowntree Quaker Fellowship, which enabled her to introduce her workshops to groups throughout Britain. Together with Fiona Rosher, curator of The Dales Countryside Museum, she prepared the non-commercial touring exhibition of the moorland paintings, which was launched at the Dales Countryside Museum in Hawes during the Swaledale Festival 2012, from May through to July. Supported by North Yorkshire Art Connections, the Yorkshire Peat Partnership and the Yorkshire Dales National Park, the travelling exhibition highlighted the ecological importance of moorland. "I also appreciate the way my local and area Quaker Meetings and Friends across the country have supported this work."